Select Avondale Painting for your interior painting projects and related work such as drywall repair. We combine old-fashioned work values, industry best practices and outstanding personal attention to provide results that will exceed your expectations. We refresh the inside of your home by painting walls, ceilings, crown and baseboard moldings, doors and windows. Led by owner/operator and registered Pennsylvania home improvement contractor Ken Dion, our Chester County-based residential painting company offers you all the benefits that 15 years of experience brings. No matter the job, we promise 100% customer satisfaction. Request a free estimate today. You have high expectations of the painting service you hire. You assume the company will do a great job at a fair price. And we promise to deliver! Count on us for outstanding performance combining first-class paint products with courteous, respectful treatment. Feel confident that all work is completed on time and within budget. This is just how we do business. Rely on us for expert advice. We are familiar with the latest interior color trends, as well as those perennial classics that look great with any décor. 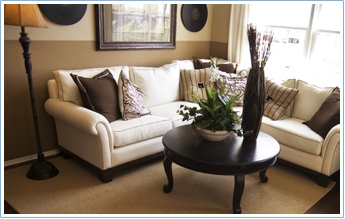 Ask us to help you select colors that bring out the beauty of a room, its furnishings and accessories. Color plays a key role in the mood and feel of a space. Use pale tones to brighten and lighten a dimly lit room. Conversely, use dark tones for intimacy. Consider a non-white color on ceilings for added drama and mood. Accentuate moldings and trim with higher gloss finishes. Right from your initial contact our attention is on you. Expect that your phone call will be answered by a team member, not a machine or an answering service. An appointment – a day convenient to you - will be created right away. A price quote will be provided within 48-hours after the consult. We respect your time and property. We will be on time for appointments and throughout the work process. Floors will be covered with absorbent cotton tarps, furniture and accessories shielded under sheets of plastic. Contact us today to hire a painting company that specializes in home interiors. We provide high-quality painting services for homeowners in Avondale, Chadds Ford, Concordville, Kennett Square and Oxford, Pennsylvania, as well as Hockessin, Delaware, and the surrounding areas.
" Ken did a fantastic job with our interior painting, including my stairway and upstairs hallway. He was superb to work with, priced fairly, and punctual. Our family will certainly be using Ken for all of our painting needs in the future! " " We have used Ken twice now and he has done an outstanding job both times. Both time involved a plumbing leak that required drywall repair and painting. The first time was just before our daughter's graduation party. Our upstairs shower leaked and damaged our family room ceiling. To compound matters several years before we had a similar problem and used an inferior drywall repairman. Ken fixed both issues and worked with us to ensure our family room looked great for the party. The second time involved a leak from the water line from our fridge which damaged out basement ceiling. Again, we turned to Ken he patched the ceiling and walls that were damaged and with the paint job you cannot tell we had any damage. We highly recommend Ken and will be looking forward to using him again, hopefully for normal painting and not for another leak repair." " Ken was recommended to us by a friend, and we hired him to paint our kitchen, laundry room, and powder room. He is a very skilled painter, meticulous, courteous, and prompt. He was very considerate of the fact that I work from home, and always kept the work area very clean. We'd hire Ken back in a heartbeat! " " We moved into a new house in Honeycroft Village, 55+ communities, and hired Ken among 3 contractors who visited. He has been most professional, very kind, and helpful in deciding final colors. He did the whole house, took his time to be exceptionally careful, taught us about paint-drying speed and capabilities, and has been a great pleasure to work with. He is respectful and did a really great job. We would not hesitate to recommend him to anyone."